Spring. Easter. Trees in bloom. Bright sunshine. Rain drops. Big sneezes. Little colds. Travels. Coming home. And chocolate. My mom asked me the other day what was my creative process to write posts. Well, there it is. I throw words on paper. Words that go with the pictures I have taken of the recipe I have just made. I take them and elaborate with each paragraph. That's the process. My way of remembering to hit all the key points of what I want to talk about. Sometimes events prompt me to a recipe. Sometimes I just execute for no other reason than the desire to cook, bake or simply eat (I know - how very pedestrian, right?!). Now, that's just me. How do you go about writing a post? Words. Pictures. Moments. They all weave together to give you a story. I like stories. For the past two weeks I have been listening to my mom tell the family's stories. Some were old news, others not. Cousins getting married. Some having babies. Planning my grandfather's 100th birthday party. Quarrels and accolades. It's a big family. It bends and it snaps. It mends together and alone too. There are events or moments however that help us cross bridges and stick together, like Easter and Spring. And chocolate. A good, simple chocolate cake. One we happily sunk our teeth into coming home from an escapade to Asheville, NC this past weekend. This was the perfect time of year to experience the duality that is early Spring in our region. Each week brings a mix of cold and hot days, sunshine and rain, thunderstorms even. Cardigans, tee shirts, pants, short, boots and sandals. All have to be at the ready for a few more days until the weather balance finally shifts completely. Back home we say "En Avril, ne te decouvre pas d'un fil" (meaning in April you are better off not shedding all your warm layers yet). Here in the South, that advice rings true comes mid-March but in his usual fashion, my Southern boy pretty much relocated all warm layers to the back of the closet. And got a cold. One of those nasty colds with big sneezes and heavy head, sore throat and low fever. And with men's general low tolerance of discomfort, you would think this is the end of the world of course. One thing that reassured me that the world was not going to fall apart for Bill was that he never lost his appetite. How can you in Asheville? One of the best food oriented towns in the South East! We had some of those typical Spring days I was just mentioning above leaving us with just a small craving for something chocolate. A small but nipping feeling that could only get satisfied with a light but intense bite of chocolate cake. In doubt. Make cake. In craving. Make chocolate cake. The world around you will instantly be comforting and lovely. This could well turn out to be my favorite gluten free chocolate cake to date. One that holds many promises for changes and substitutions. We had it plain but I can easily foresee the addition of pecans, walnuts or pistachios in the near future. Maybe chocolate chips added to the batter for that little extra fudgy feeling when they are still warm out of the oven. A ripe mashed banana could easily find its way in there one day soon. Who knows? Can't wait to bake it again! Notes: I like to use superfine gluten free flours more and more gluten free baked goods as some people always have issue with the slight change in texture and softness compared to regular all purpose flour. They are easily found online but feel free to use whatever you have on hand and if you don't have to go gluten freee, use regular flour instead. By choice, I've almost completely switched to baking with maple syrup, honey or sucanat which I used here but feel free to use regular sugar instead. Preheat oven to 350F and position a rack in the middle. 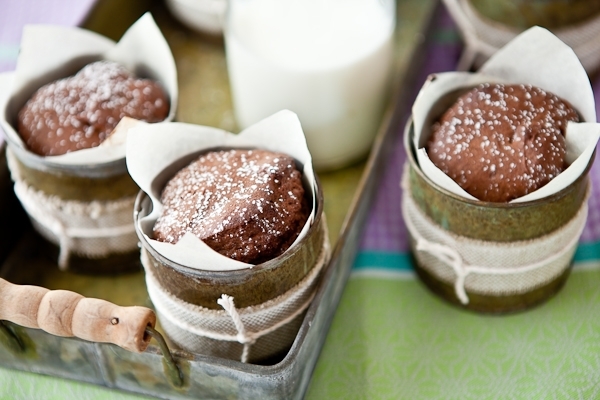 Line the inside of 8-10 muffin tins with cupcake liners, or 8 ramekins or one 8-inch round cake tin (use a piece of parchment paper at the bottom). Lightly butter or spray the inside of the tins. In the bowl of an electric mixer, whip the eggs and sucanat/sugar for 2-3 minutes at medium speed until light and airy. Turn the speed to low and add the sour cream, the melted chocolate and butter and continue to whip until everything looks fully blended. Slowly add the cocoa powder, all the gluten free flours (or all purpose if using), the gum, baking powder and pinch of salt. Turn the speed back up to medium and whip until the batter comes together in a uniform manner. Divide among the prepared cake tins (or one single cake pan) and bake 25-30 minutes or until a toothpick inserted near the center comes out clean. My mouth is just watering. What an absolutely gorgeous presentation! Your photos are beautiful and I love the elegant way you served your chocolate cakes. I want to get on a plane right now and fly to S. Carolina and eat all of these! 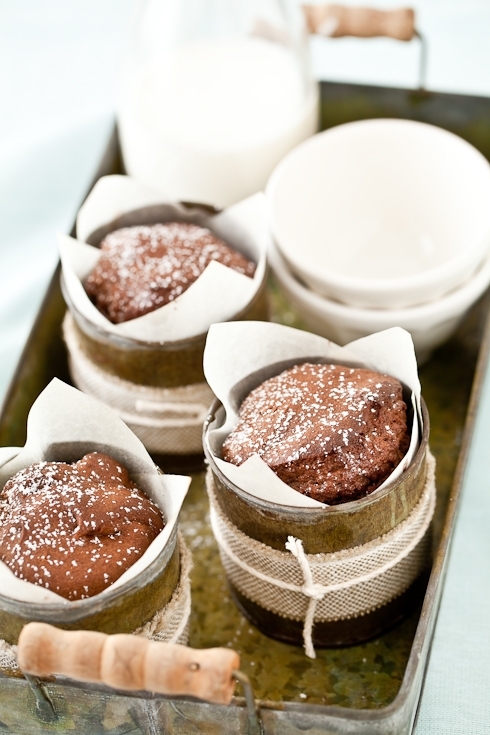 They look and sounds fantastic - and I love those little cups/pots that you baked them in! So cute! I so agree! Chocolate cake just makes everything seem fine again! These look amazing, and of course you beautiful photography, these pictures make me want to make them. Hi Helen, I'm brazilian, and I just love "My Tartelette.com"! The pictures are marvelous and the recipes are very sofisticated. Once I made your "Chocolate trufle tart", stenciled a chocolate pouwder heart on top, and it made a huge success! They're especially easy to translate to portuguese because of the measures in grams (we just don't know nothing about pounds, inches and ounces! ), so I really have fun with them! Can't wait to make this cake! Your presentation is lovely - are those tin cans? I love how it looks so rustic, yet so refined. Your posts are always the perfect mix of lovely writing and beautiful photographs. Stories are good. So is chocolate cake! "For god's sake woman, he's a man--he's got a 'Man Cold!'" ...and the cake looks divine. I always give a big satisfied sigh when I look at your pictures, that little tray full of cakes looks so beautiful. Adorables ces petits gâteaux au chocolat ! My husband has to eat a gluten free diet, and I'm just now learning how to make gluten free things for him. I'm impressed with recipies and presentations like this that show "gluten free" doesn't have to equal "cardbord crap." This is so inspiring to me! Thanks!! I loved chocolate ! You're photos are so amazing ! So so gorgeous. Thanks for providing an alternative to the GF flours, as I think I'd find it hard to source all those flours. Definitely something I'm going to make. I love the rustic look of those tins. Gorgeous shots as usual! What a fun, yet elegant way to serve my favorite food! I love the presentation!!! I trust you instantly :-) The use of different flours is very interesting. This would be lovely for Easter! Where did you get those cups the cakes are baked in? They remind me of a technique I've seen done, where you use tin cans from beans/soups. these photos are so lovely - and you capture so well the shifting seasons. here in minnesota, we had a strangely warm day (in the low 70sF! ), but layers will be necessary for a while yet! i have a question: i've been following your recipes for a while and am also shifting towards honey/maple syrup instead of sugar. do you (or others reading this) have a good rule of thumb for quantities of substitutions for sugar? or a good resource/reference to suggest? thanks as always for sharing your recipes, photos *and* words! Love the story and all of these photos. This is totally spring eats. i always looks forward to your posts and stories! and of course the delicious recipes. ive never made a gluten free cake but i'd love to experiment & this one sounds too good to pass up! Your photos are always so amazing! I love your blog so much! My writing process is kinda... Weird, I guess. I never feel like I have very much to say, but I try to make a simple observation on a mundane thing and go from there. Otherwise, I just try and try and try. Doesn't always turn out so well! Your writing and photos are lovely. I'm so glad you're sharing a chocolate cake recipe. Chocolate cake is one of my favorite foods! We'll be making these this weekend - I just happen to have all the ingredients in my cupboard. Perfect recipe for Easter. Thank you! This cake look simply delicious ! Hooray for Asheville! I always jump for joy when I discover someone else who loves my hometown as much as I do! where did you eat?? I always look forward to your stories! Although I always love your recipes and your (INSANELY) gorgeous pictures, your stories are what have kept me coming back over and over again over the years! Thanks for sharing so much of the wonderful you! My kids are what inspire my posts. Those chocolate cakes look great. Now I'm in the mood for cake! Is superfine rice flour different from regular rice flour??? I've never seen it before! Loved reading your story! gorgeous cake & photos! Those are nice looking tartlettes! I bet they really taste good! The presentation is also cute! Thanks for sharing this recipe! What a lovely post. Your pictures are truly gorgeous today. 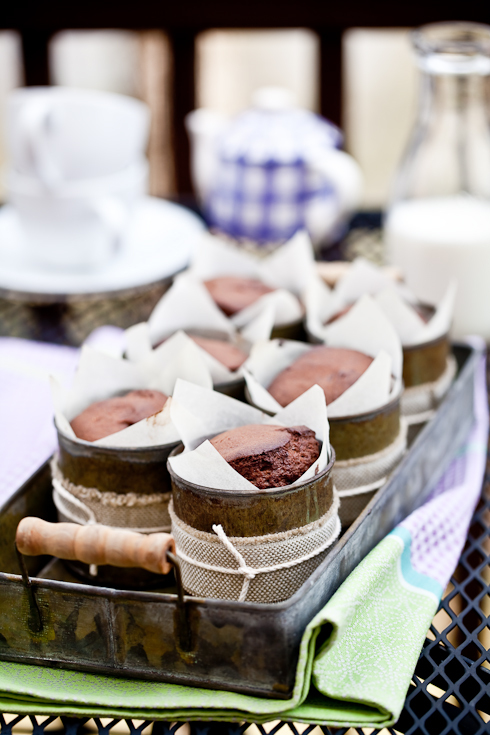 I love chocolate cakes - these look beautiful in their individual tins. The last time I visited Asheville was in April, the perfect time, most definitely spring but also with some cool nights. It's a great food town. I have been looking for a recipe that I can add my own chocolate and less cocoa and here it is. I love the cups you put them in. The one thing I always do with chocolate cake is add in a shot of espresso. I enjoy your posts because of your story telling along with such great recipes. Chocolate cake will make anyone or any day better just because. Understand about the man thing too, so funny aren't they. My son thought is was weird when I saved all the 'tin' cans to make little cakes. Your pictures reminded me of that and my grandmother's coffee can cakes. Thank you. Yes to the pistachio version! These look absolutely to-die-for, but perhaps my resistance is just low because I've been working non-stop for five days... It's time for some sleep. Thanks for another delicious post! geogirl: when it comes to sucanat I pretty much use the same amounts as sugar. For honey, I use about half. Maple syrup I go by taste. It's best to take the time to figure out what you like best for your palate. Margaret: yes it is very different. I am having a hard time using regular rice flour now. I love the tiny tins these cakes are in! Your photos always seem to blend beautiful rustic elements with modern presentation ideas. I love your blog! For a while I sat there looking at your title. It has always been something more complicated that just Simply good Chocolate Cake. But when I looked at the recipe, hahaha, as usual, Tartlette's never that simple. Wendyywy: I think what looks complicated is the list of the gf flours but the rest is very standard cake making method: eggs+sugar+sour cream+butter+flour, baking powder, mix and bake. Hope you try it some day! Love the presentation and the photography is just incredible! Oh my god, ils sont terribles tes petites douceurs chocolatées et quelles photos magnifiques! So so beautiful. I can't get enough chocolate right now. My friend just sent me some chocolate for hot chocolate from Florence and I had three yesterday. Your presentation of these cakes is gorgeous! My posts are never written sitting in front of the computer. Ideas for them come to me at the oddest times - in the shower, while walking our dog, while folding laundry. I suppose it's times when my mind is not otherwise occupied. You are so right about baking a cake to make everything right again. It's like bringing a fairytale moment into our lives. I always bake to de-stress and nothing beats chocolate cake. Ever! I love the individual pans that you used to cook these little jewels in as well as the spoon with the little flowers on the handle. Beautiful. One layer of chocolate goodness is something that I want right now. 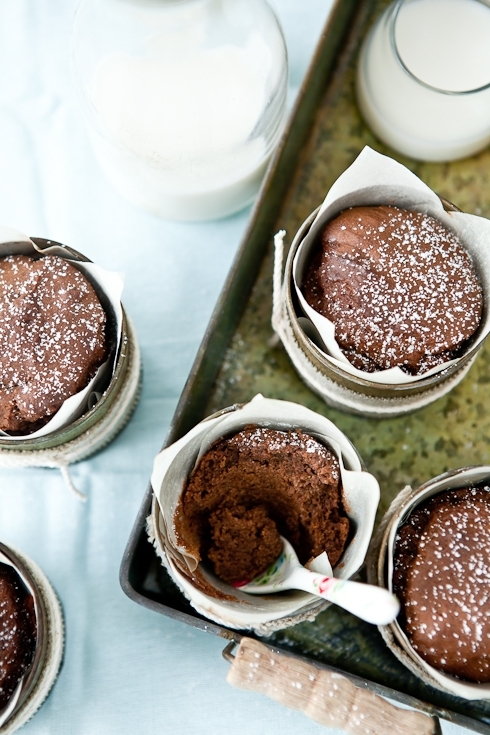 I love the little individual muffin tins you used. Your treatment of the whole scene is simply beautiful. It's always interesting knowing one's process of writing a post. 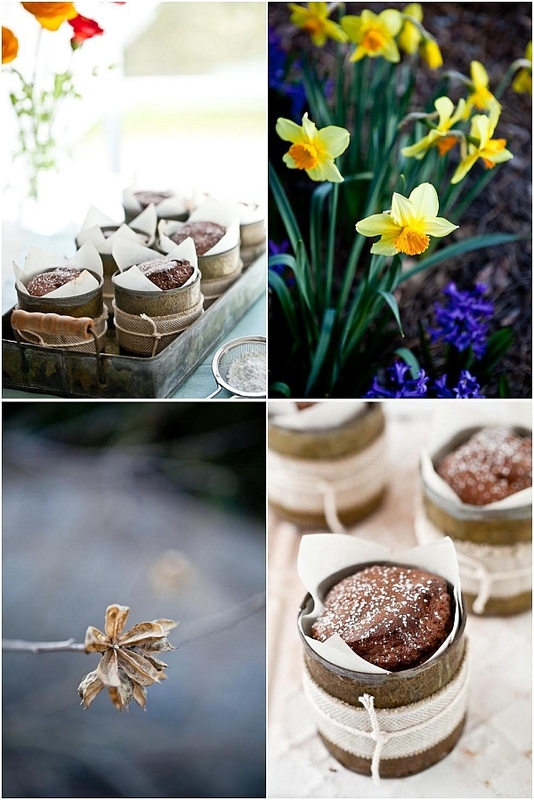 Beautiful photographs... beautiful chocolate cakes! Ohhhhh my these look amazing!! what a great idea to entertain!!! Ces mini-cakes au chocolat sont super mimi et appétissants, et la présentation est magnifique, comme toujours! Chocolate is my weakness. I must make these. And if I then post about them? Well, not sure what I would write. I have no process! Your photos, your props, your uncanny ability to use your light source, simply...PERFECTION. I am in awe. And I may even try these gluten free delights. Foodie: I am not sure I understand your question, as there is not "one" all purpose GF flour, which is why we combine a few. You can certainly pre-mix all the flours in large quantity and keep them in a jar, creating a sort of GD baking mix if you like. Oh GOD, so delish!!! <3 Just finished them - so smooth and soft, not too sweet either, although I had to use chocolate with 50% cocoa. I think about serving them with selfmade blueberry jam or a bit of mousse; just great! Can I use 2 cups JeannF mix instead? Swarna: Absolutely. I have not tried this recipe with her mix but I don't see why not! I came home from work 8:30 pm and was craving some comfort. So I made a patch of your chocolate cakes. Thank you for the comforting moment on the sofa with a piece of chocolate cake.